The Placement of Accidentals in 4 Note Chords can be confusing. So, why don't we just make it SIMPLE! In Blog 1 of this Series, we looked at the Placement of Accidentals in Harmonic Intervals (2 accidentals). In Blog 2 of this Series, we looked at the Placement of Accidentals in Solid Triads (2 and 3 accidentals). We are now going to look at the Placement of Accidentals in 4 Note Chords (2, 3 and 4 accidentals). Yes, there is a rule. No, Students cannot just throw accidentals anywhere. Are you ready to discover the EASY RULES that will make this SUPER SIMPLE for our Students? There are rules for the Placement of Accidentals in intervals, triads and chords. 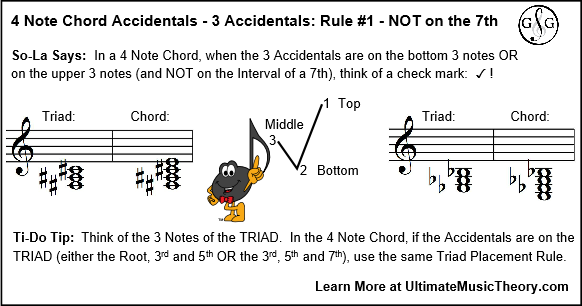 For the purposes of this 3-Part Blog Series, Blog 2 deals with the Placement of Accidentals in 3 note "Triads". Yes, a 3 Note Triad can also be called a 3 Note Chord. However, I like to KISS = Keep it Super Simple. Since "TRI" means "3", I like to call a 3 Note Chord a TRIAD. 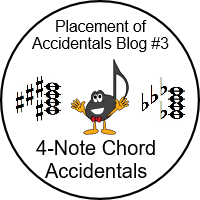 This Blog, Blog #3 in the Series, will only look at the Placement of Accidentals in 4 Note Chords. The LOWEST Accidental is placed on the LEFT; the upper Accidental is placed on the right (before the notes). If Ledger Lines are involved, the Ledger Line is NOT extended to meet the Accidental. The Accidental is placed horizontally with the notehead. By looking at our 2 Accidental Examples, you can see the INCORRECT and CORRECT way of writing 4 note chords using ledger lines and accidentals. Can you see how silly it looks if the Ledger Lines are extended to meet the accidentals? When there are 2 Accidentals and they are placed on the Root (lowest note of the 4 note chord) and the Seventh (highest note of the 4 note chord), the accidentals are lined up vertically. 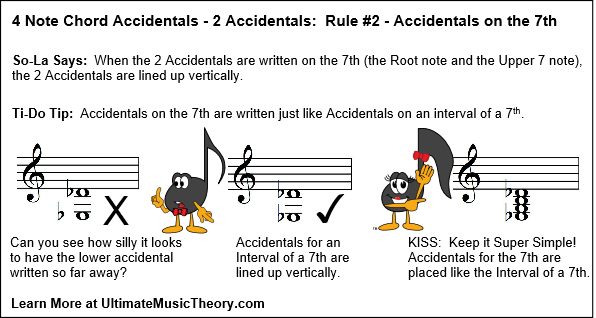 This accidental placement matches the placement of accidentals for an Interval of a 7th - the accidental for the lower note, the Root, is placed directly below the accidental for the upper note, the 7th. 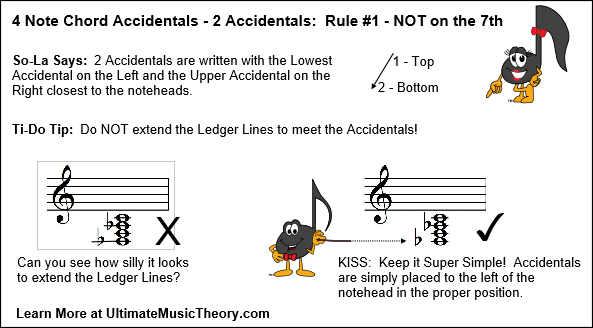 Again, there are 2 different rules when adding 3 Accidentals to a 4 Note Chord. In this situation, the 3 Accidentals follow the same rule as adding accidentals to the 3 notes of a Triad. 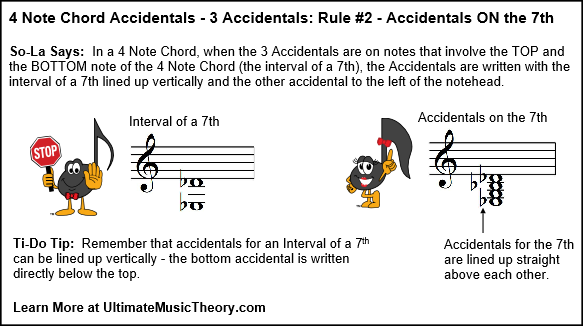 Rule #2 for adding 3 Accidentals in a 4 Note Chord involves the use of accidentals on the Interval of the 7th - the bottom Root note and the upper Top note (the 7th). In this situation, remember the Rule for Intervals of a 7th! When writing a 7th, the accidentals are written lined up vertically (one above the other). So add those accidentals to the 4 note chord first. The other accidental, the "middle" accidental (either on the 3rd or the 5th) is written to the Left. 4 Note Chord Placement of 4 Accidentals: The ONLY Rule! The Accidentals for the Interval of a 7th (the Root and the 7th) are lined up vertically. The Accidental for the "lower middle" note, the 3rd, is lined up to the left - furthest away. The Accidental for the "upper middle" note, the 5th, is lined up to the right - closer to the accidentals for the interval of a 7th. There are a lot of Rules when it comes to writing Accidentals for 4 Note Chords. However, they are really simple when you practice them. I like to make it a game with my students. Using their Student Whiteboards, I have them write a 4 Note Chord. Then, on my Large Teacher Whiteboard, I will list accidentals for them to write. For Example: Add a Sharp to the Root, 3rd and 7th. Erase. Add a Flat to the Root and 7th. Erase. Add a Flat to the Root, 3rd, 5th and 7th. Erase. Students love their Whiteboards! It is so easy to "erase" and we don't have to worry about throwing out paper. 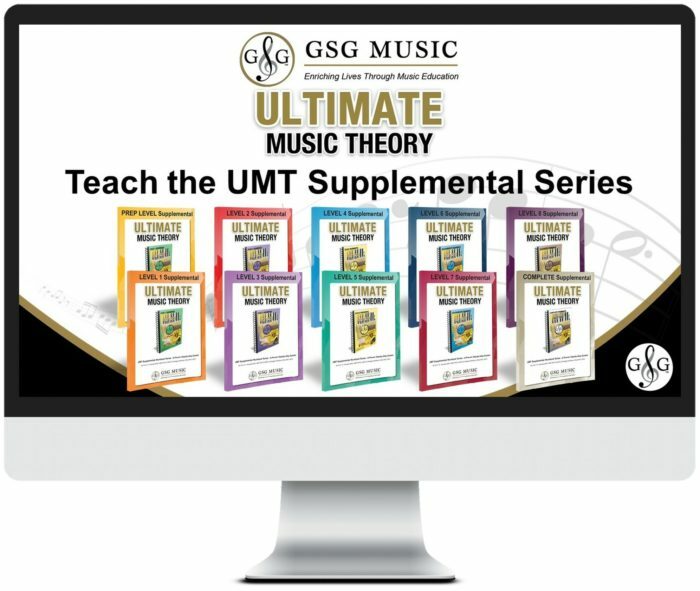 I do hope that you have enjoyed this 3 Part Series on the Placement of Accidentals in Harmonic Intervals, in 3 Note Triads and in 4 Note Chords.